Folk group the Limeliters were formed in 1959 when Lou Gottlieb, who had recently earned a Ph.D in musicology (his dissertation was titled “Liturgical Polyphony of the 15th Century”) and was working with the Kingston Trio as an arranger, heard Alex Hassilev and Glenn Yarbrough performing in a nightclub. Lou’s idea that the three should work together making demos for the Kingston Trio soon changed course; they blended voices and talents so well they decided to begin performing together as a trio themselves. They quickly became a fixture at the Limelite Club in Aspen, Colorado, from which they took their name. Soon after they were signed to a recording contract, doing over 300 shows per year, and appearing on TV shows and Coke commercials. Their first few albums were the typical topical folk of the time, perhaps a little less counterculture than some, but with a decidedly greater measure of frivolity. They were at their best in a live setting, where bass player Gottlieb’s articulate humor shone in his role as MC, folk music historian and master of casually witty between-song banter (see “Grace Darling” below). 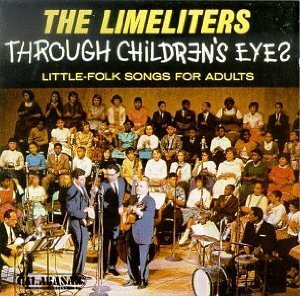 In 1962 the Limeliters released what is still the greatest children’s album I’ve ever heard and the one all three group members agreed was “the best album we’ve ever been associated with”. On a personal note, Through Children’s Eyes was a favorite of my father’s, has been passed down from me to my own children, and is currently the most requested minivan road trip music of my 2- and 3-year-old grandchildren. As four generations of my family will attest, this timeless album of “little-folk songs for adults” can’t miss with anyone exposed to it at a tender age. Through Children’s Eyes features a selection of both folk standards of the day (“This Train”, “Morningtown Ride”, “The Riddle Song” and the closing “American the Beautiful”/”This Land is Your Land” medley) and lesser-known gems you likely won’t have heard elsewhere. The live performance, a benefit for the music program of the Berkeley, California school system, was recorded at the Berkeley Community Theater during Christmas week in 1961 with 70 Berkeley-area elementary school children. The resulting record (which hit #25 on the album charts) was so cherished by children that decades later the Limeliters found themselves signing worn album covers for middle-aged fans at concerts. Ah, but that “decades later” came after several lineup changes, beginning shortly after the release of Through Children’s Eyes. With the Limeliters having survived a plane crash late in the year of its release, they began to reevaluate priorities. Yarbrough left for a solo career. Hassilev turned to producing and acting. As for Lou Gottlieb, he worked briefly for the San Francisco Chronicle as a classical music critic before co-founding, in 1966, Morningstar Ranch in California’s Sonoma County–an experiment in communal living. Yes, the rather dorky looking besuited upright bass player in the cover photos above, the guy who’d written his doctoral thesis on 15th century cyclic masses, formed a hippie commune–clothing optional. Even if you have no kids, and no particular use for a kids’ album, do check out the clever lesson the Limeliters and their kid chorus give grown-ups on “Hey Jimmy, Joe, John, Jim, Jack!” and their witty rendering of the story of English heroine “Grace Darling”. You don’t have to listen through children’s ears to enjoy this.